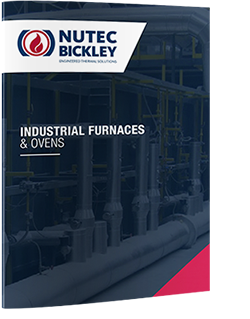 Nutec Bickley provides heavy duty moving hood furnaces for the heat treatment process (Normalizing, Annealing, stress relieving and others) of steel forgings and castings and large steel plate formed parts. This furnace is an excellent alternative for heavy loads placed in several stationary bases, and moving hood furnace is travelling to the required heating station. Eavy duty refractory base designs with high resistance to thermal shock. Nutec Bickley provides heavy duty moving hood furnaces as an excellent alternative for heavy loads placed in several stationary bases, and moving hood furnace is travelling to the required heating station. Furnaces are designed in custom designs and dimensions for temperatures up to 1200 F (650 C) for the following processes. Heavy duty refractory base designs with high resistance to thermal shock. Nutec Bickley provides heavy duty moving hood homogenizing furnace systems with the best technology for aluminum logs and ingots in order to provide workability and to improve surface appearance of extruded products. Logs can be treated in diameters from 6” to 14” and in full lengths or in sections.